Prasa’s massive R172 billion, 20-year plan to modernise its ageing trains and infrastructure is off to a slow start, with just one station completed in the five years since it began, out of a planned 135 “priority” stations. At that rate, it could take more than the planned period to finish the work, by which time the systems will be obsolete and have to be replaced again. “From the current 135 stations identified as priority stations, 28 are at various stages of development inclusive of the four thirdparty [co-funded] projects – these being Leralla, Germiston, Roodepoort and Vereeniging,” says Prasa’s website. Even then, modifying and upgrading those 135 train stations is still less than half the number of stations owned by Prasa. According to Metrorail, a division of Prasa, Prasa owned 317 of the 468 stations operated by Metrorail, with the remaining 151 belonging to Transnet Freight Rail. The station modernisation project was launched in 2014. Prasa’s 2014-15 annual report noted “four stations are at various stages of modernisation”, in 2015-16, acting Prasa CEO David Kekana noted “Greenview station in Mamelodi is at practical completion stage with Philippi and Duffs Road stations at 76% and 98% completed”. The 2016-17 report stated the Duffs Road station in Durban was completed while the 2017-18 annual report noted Philippi in the Western Cape and Oakmoor in Tembisa were supposed to be completed by financial year-end, although these were still a work in progress due to various issues. 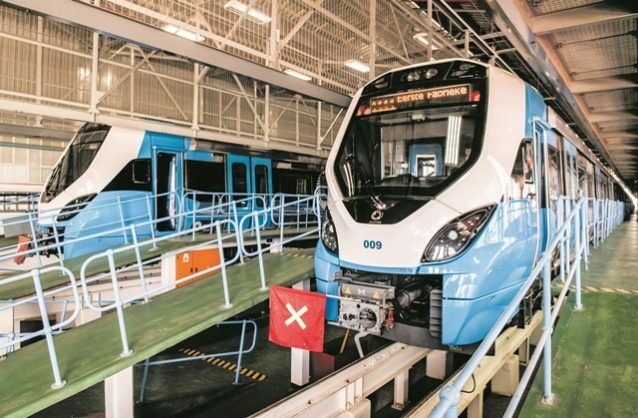 Recently, Prasa shocked the nation by trapping President Cyril Ramaphosa on a train for two hours, followed later by pictures of a beaming Ramaphosa stepping into the gleaming new Prasa blue trains from Brazil. In 2018, Engineering News noted a “significant” challenge Prasa faced was that platforms were too low for the new rolling stock, something it had been aware of since the beginning, and the “project to lift the platforms at stations has not been progressing as expected, says [Prasa group executive for strategic asset development, Piet] Sebola”. When questioned on the progress of the modernisation programme, Prasa group chief strategy officer Dr Sipho Sithole explained rail in South Africa was more than 150 years old, with some current stations built as early as 1910. “You are welcome to go and check this at Pretoria station. First, Sithole said, R59 billion would be spent on new rolling stock with the balance going to modernisation. “The platform rectification programme promotes access for disabled commuters. “The station modernisation is aimed at introducing efficient travel for all commuters, with the construction of elevators where necessary,” Sithole said. “Station modernisation and platform rectification programmes will deal with the issue of train to platform gap,” Sithole said, confirming a “total of 135 stations have been earmarked for stations for modernisation over the next 20 years”. It’s not only the ride height which is the problem, rail expert Dr Willem Sprong said. The gap between the train and the platform was also a major cause of injuries, according to the Rail Safety Regulators state of safety report, with more than 700 “platform-train interchange occurrences (PTI)” across all the rail operators when “passengers … entrain and detrain stationary or moving trains” during 2017-18 – an increase of 30% compared to 2016-17. “During the 2017-18 reporting period, four fatalities and 737 injuries were reported as a result of PTI occurrences,” the report stated. Last week, Ramaphosa said at the launch of two new trainsets in the Western Cape it was “critical that Prasa proceeds with urgency – and with the necessary support from government and other stakeholders – to implement its turnaround plans”. Rail tracks or perway rehabilitation.